Embellish™ Angel Loft Bamboo, our special edition 50/50 blend, is made from sustainably grown plant-based fibers blended with 50% cotton fibers which results in an easy to stitch, thin, soft batting. The naturally porous fibers contain anti-microbial properties creating a moisture wicking foundation ideal for warmer weather quilts, garments and projects. This incredibly soft, silky yet durable quilt batting offers a stable center for machine embroidery, embellished or very simple wall hangings, bed quilts, pillows, garments, bags and more. The batting contains a stable center that will not stretch and can be embroidered or quilted up to 8”-10” apart. Expect slight shrinkage when laundering. Testing has proven shrinkage to be no more than 2% when the finished quilt is laundered and dried in cool temperatures in a gentle cycle. However, should you use hot temperatures while washing and drying, the quilt could shrink 3-5%. Quilting, Garment and Project fabrics can shrink up to 3%. 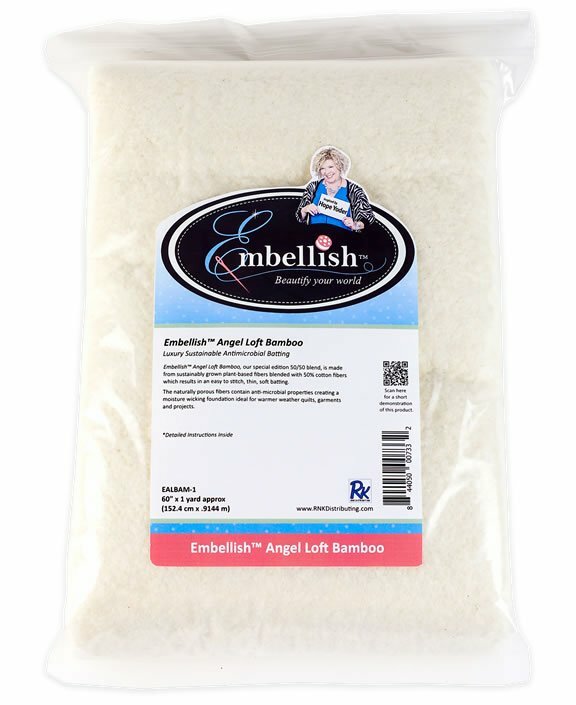 Pre-shrinking Embellish™ Angel Loft Bamboo can be done by hand-washing in cool water with mild detergent. Soak for 10 minutes, squeeze out excess moisture by rolling up in a dry towel. Air-dry flat. Baste or pin all layers together. Machine or hand quilt/embellish at least 8-10" apart. Place one layer of Embellish™ Cutaway Soft in the embroidery frame. Place one piece of Embellish£ Angel Soft Bamboo over the cutaway and baste in to place. Begin piecing process according to design instructions.